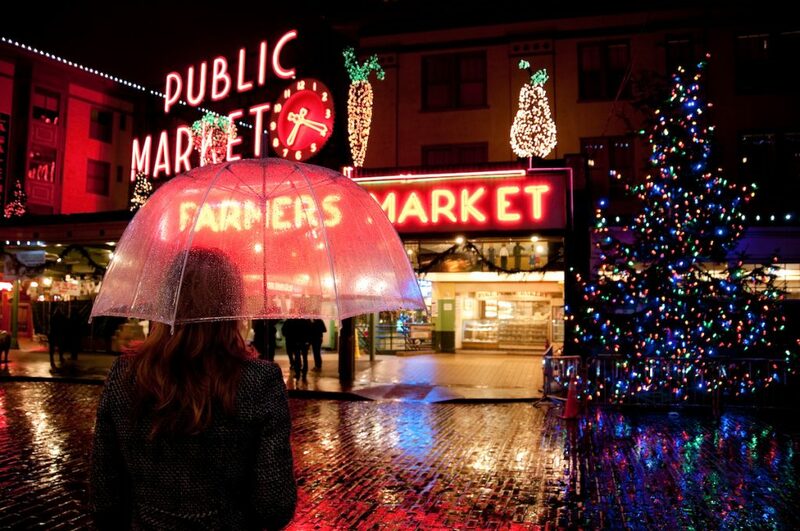 While snow in Seattle during the holidays is usually a little bit up in the air, you can always count on the city to bring the festive fun. Whether you’re down to brave the winter chill roaming the Woodland Park Zoo, or you’re looking to get gussied up for a matinee of the Nutcracker at McCall Hall, you’re sure to be cheered by the city’s seasonal spirit. At the Woodland Park Zoo’s WildLights, you can admire all sorts of exotic critters—both real and illuminated. Over 600,000 energy-efficient LED lights are strung in the shapes of animals and their habitats, guiding you along the zoo’s pathways and North Meadow. After you’ve made a few new baby seal or panda friends, head to the Snowmazium for an indoor, faux-snow snowball fight. Experience the elite Pacific Northwest Ballet and orchestra in Seattle Center’s McCall Hall. Highlights include the venue’s festive decor, Ian Falconer’s gorgeous costume designs, and, of course, Tchaikovsky’s classic score interpreted by world class musicians and dancers. Shows run through the month of December, and are sure to get you in the holiday spirit. Catch Home Alone (12/14) or Love Actually (12/21) on Peddler Brewing Company’s outdoor, covered patio. There’s no better way to warm up in Seattle than with a craft brew, and a feel-good Christmas flick. Dubbed “The most original drag performer working in America today” by The Village Voice, Dina Martina stands ready to wow audiences with wickedly funny songs, stories, costumes and audience gifts—just in time for the holidays. She’s a master entertainer, and offers an awesome alternative to anyone looking for something a little edgier than Tchaikovsky. Each weekend, from Friday, 11/14, through Sunday, 12/24, the Downtown Seattle Association and Urban Craft Uprising host an outdoor holiday market including over 20 local makers and artists. Stop by to support small businesses, and to pick up those last few gifts on your list.